Click here to view current Home Care Services opportunities. The specialty of Home Care Services exists to extend the same level of quality, compassionate care patients receive on site at UMHS hospital and clinical facilities, to patients receiving care for various conditions in their own homes. The success of Home Care Services is made possible through the exceptional, innovative care of Michigan Visiting Nurses (MVN), a full-service home nursing agency with nearly a century of experience caring for the residents of our local communities. 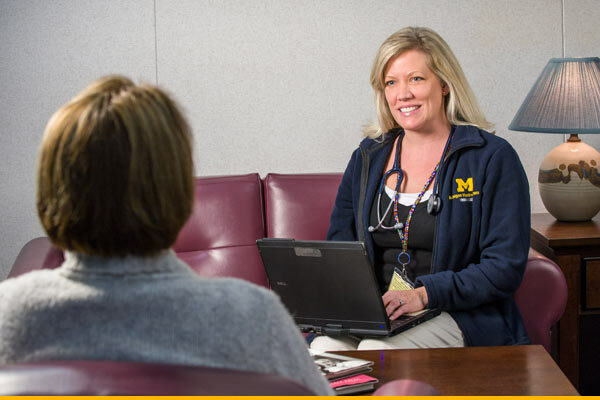 Michigan Visiting Nurses provides value-driven, home patient care, in partnership with the Hospitals and Health Centers and facilitates ideal patient transitions between the hospital and the home. Customer Satisfaction – We are committed to meeting and exceeding expectations by providing individual attention to: patients and their families, our employees, referral and reimbursement sources, and affiliates. Integrity – We are honest and forthright in our dealings. Respect – We recognize the quality, diversity and importance of each other and those we serve. We are committed to teamwork while recognizing and valuing the contributions of individuals. Compassion – We care about others and respect their feelings. Excellence – We strive to be leaders and the best in everything we do. Collaboration – We acknowledge the importance of partnering with our colleagues to accomplish seamless patient care and smooth transitions.